Management data APIs are endpoints that let you remotely update, add, and query the status of different artifacts in your BizTalk Server environment. The endpoints are added using REST, and come with a swagger definition. Starting with BizTalk Server 2016 Feature Pack 1, there's a Windows PowerShell script that installs these REST APIs, and their swagger definitions. These APIs make REST calls to remotely manage ports, orchestrations, partners, agreements, pipelines, and more. 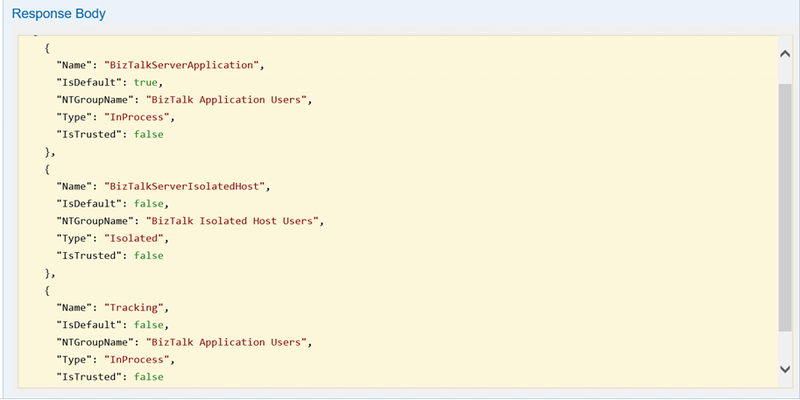 To see the available APIs, and what you can do, see Feature Pack REST API reference. Install IIS on the BizTalk Server. Confirm IIS is installed on the BizTalk Server by opening Internet Information Services Manager. In most BizTalk Server environments, IIS is already installed. See Hardware and Software Requirements for BizTalk Server 2016. Run Windows PowerShell as Administrator (Start menu > type PowerShell > right click > Run as administrator). To confirm it’s working, browse to http://localhost/BizTalkManagementService/swagger. 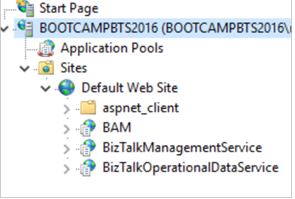 If you are prompted to sign-in, sign in with an account that is member of the domain\group you entered in the previous step (-AuthorizationRoles 'BOOTCAMPBTS2016\BizTalk Server Administrators'). Now that the REST APIs are exposed through IIS, they can be accessed and executed by other applications. Feature Pack REST API reference lists the APIs. On the BizTalk Server, browse to http://localhost/BizTalkManagementService/swagger. If you browse to http://localhost/BizTalkManagementService, you should get a 500 error. That’s a good thing. Just add /swagger to the end of URL, and you’ll see the available REST APIs.